For January, Book Lovers Never Go To Bed Alone Again discussed another book we were lucky enough to get from Harper Collins Book Club Girl Group, The Given Day by Dennis Lehane. The Given Day is a massive 700 pages long and yet it only covers a period of two years. And even at that length it feels like so much material packed into a small space and yet when it was over I still wanted more (luckily there is Live by Night to pick up next). This was my first time reading any of lehane's works and I absolutely love his writing, it has such a cinematic quality. I can see why so many of his novels are adapted for the big screen. I felt like a movie was playing in my head, as I read I could so easily visualize the story and the characters. Lehane's research is also amazing. The historical material covered ranges from baseball to bombings and every bit of it is accurately portrayed. He makes it so interesting and I felt drawn into each event. At the start of the book we find Babe Ruth's chance meeting of one of the main characters Luther Lawrence and I was intrigued to see where this was going to go. We don't see Babe Ruth again until we've read several 100 pages (I was beginning to wonder if he was coming back or if it was just a cameo) but I really enjoyed his use of the baseball metaphor and would have loved to see more of that. 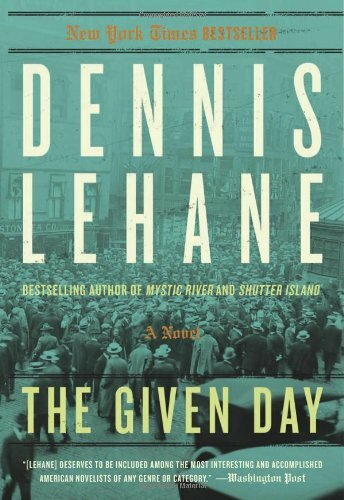 I enjoyed The Given Day and the characters Lehane has created to tell us about this time in history. The Characters were very authentic and came to life. They were fallible human beings, no caricatures here. Our discussion covered so much and we were sorry when we had to end because I think we could have kept talking about this book for hours. i would highly recommend this book for your next book club.